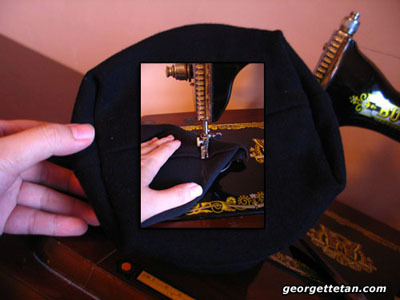 The process for making the hat is pretty much what you see on Peggy’s blog. I deviated when it came to covering it with fabric because I ran out of felt and messed something up. I fixed it but I didn’t take photos of the process because I was too absorbed in the work. 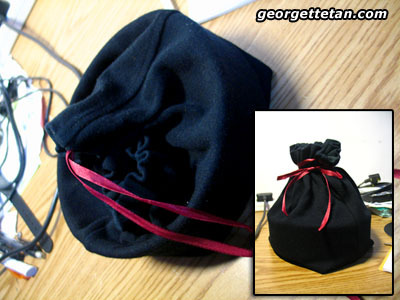 Anyway, the secret compartment is actually a drawstring bag with a cardboard frame inside to wedge the bag in place. 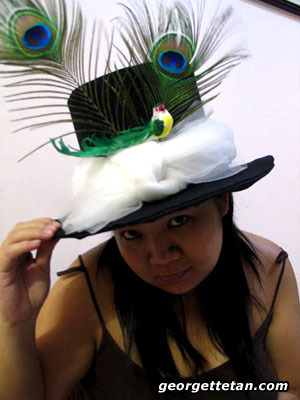 Make the frame with a strip of sturdy cardboard about 2 inches wide (customise according to the height of your hat and how much of your head is actually in the crown). Make sure it’s long enough to wrap a full circle when placed inside, but give a little space so the frame doesn’t fit too tightly. There has to be some room for your cloth bag and a bit of space to allow the bag to be removed. But it still has to wedge in there enough so that it doesn’t fall out easily. Measure how much you need (the height of the crown + one or two extra inches). 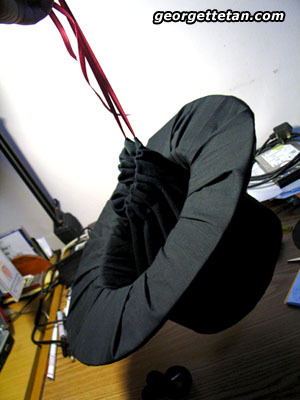 If you’re fixing the bag permanently in the hat, the height of the crown is probably enough, but my bag is meant to be taken out and used separately if desired. 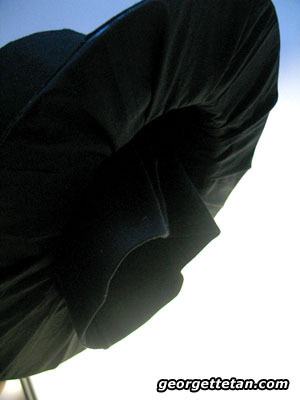 I was fortunate that the width of the pants leg is exactly the size I need so I didn’t need to make any adjustments. 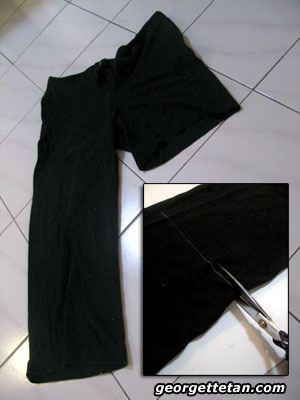 If the hem of the pants is still there, you can snip a slit and thread in a ribbon to make the drawstring closure. Make sure your bag is inside out before you sew the other end shut. Don’t turn it to the right side of the bag yet. Slip the cardboard brace into it so that it creates a flat bottom. Look! Batman! Fold the “ears” in and mark it off with tailor’s chalk. Sew it straight across (take the brace out first) as shown in the inset below. 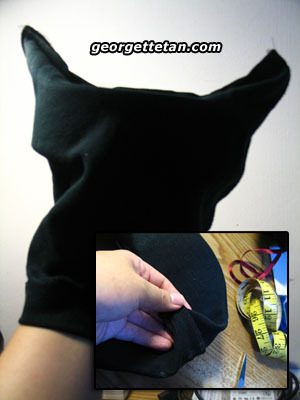 Trim the “ears” off if you want to (you might want to do this with thick fabric). Now turn the bag out to the right side. You should get a flat bottom bag now. Stick the brace back in and gloat a little about your progress so far, especially if you’re like me and just learned to use the sewing machine yesterday. 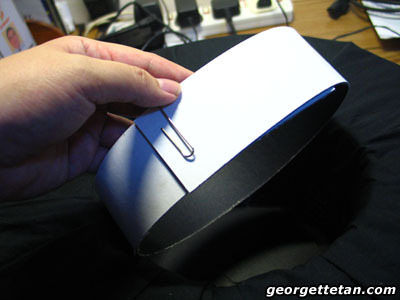 Now let’s work on reinforcing the brace, which is something you could have done before you tackled the sewing machine. But I needed to sew super quick because the machine is located in an badly-lit spot in the house – you can only see what you’re doing by daylight because the room lights are behind you when you sit there. Anyway, trace out the shape of the brace on a convenient piece of sturdy cardboard. Cut and tape it in place. 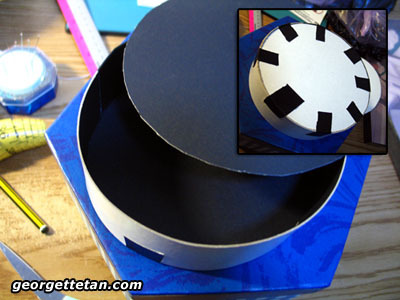 Optionally, cut it a wee bit smaller so you can just about pop it inside the “ring” before taping. I’m using mounting board leftover from another project. Since it’s already black on one side, I made sure the white sides are facing out; it’ll be hidden once it’s in the bag. I originally wanted to include a lid (seen above) on my brace so it becomes a box inside a bag, but alas, the top of my head hits the lid before the hat settles properly in place. This might work better if the brace was narrower or the crown is taller. The box bottom creates a sturdy… er, bottom when you carry the bag by hand. It’s also a super awesome way of hiding your messy stitches inside! The main picture is an empty bag (not counting the half-box). The inset is the bag stuffed with things to make it stand up. It’s not gonna hold that much stuff if it’s inside the hat and you plan on wearing it. but it does make a pretty loot bag. If you’re enterprising enough, you can add some flat embellishment outside. This is also a good time to mention that you need to take the thickness of the fabric into account if you’re making a drawstring bag. Bunched up thick fabric takes up space. You might wanna pick a lighter fabric or have some other type of closure, like a zipper. It also holds the weight of the hat! Decorate your hat to suit the occasion or costume, and enjoy! 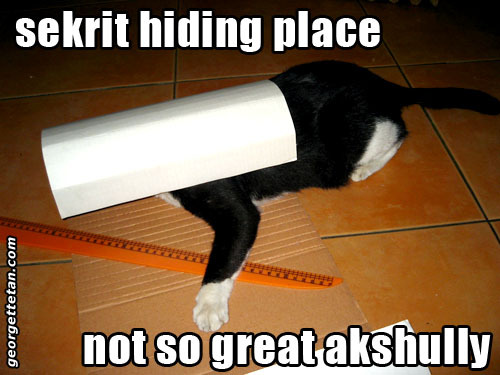 Next Lolcats can be green too! 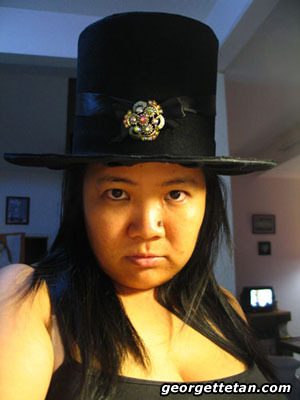 hi, where can i buy felt in kuching? do the local textile merchants have them? cutepinky: I get mine at the supply store at China Street in town. There’s a three-shop store (next to the corner jewelery store) selling all sorts of sewing, knitting and crafty things. Felt is about RM1.50 for a 1-foot square piece or RM16.50 per metre. hihihi … my Mimi is now a LOLKAT? Wow.. Very nice hat !! How much time did both of you take to finish the whole thing? 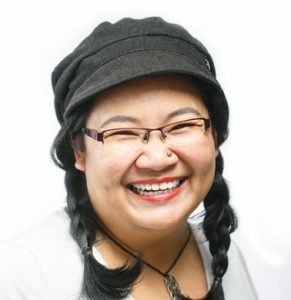 i followed ur F & B column regularly last time in the Borneo Post (r u still doing it?) must say ur pics and comments made me wanna visit those places featured =) juz wanna ask u whr do u get ur supply of felt? i have been trygin to get my hands on felt material but nvr seem to manage to find it locally in kch. thx and keep it up! There’s a shop called Wai Hing along China Street that sells felt. thx! will be visiting that shop soon!